Okay, I admit it. When I was younger (so much younger than today), I used to drink Pabst Blue Ribbon. Its reputation has been, as long as I can remember, “red neck” and “cheap!” But, still, that was my beer of choice. My tastes have evolved over the past 30 years or so, but you can still usually find couple of cold PBRs in my garage refrigerator. 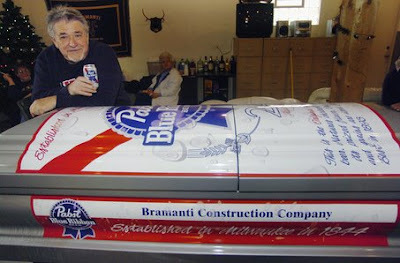 Bill Bramanti with his Pabst Blue Ribbon casket. SOUTH CHICAGO HEIGHTS, Illinois -- Bill Bramanti will love Pabst Blue Ribbon eternally, and he's got the custom-made beer-can casket to prove it. "I actually fit, because I got in here," said Bramanti of South Chicago Heights. The 67-year-old Glenwood village administrator doesn't plan on needing it any time soon, though. He threw a party Saturday for friends and filled his silver coffin -- designed in Pabst's colors of red, white and blue -- with ice and his favorite brew. "Why put such a great novelty piece up on a shelf in storage when you could use it only the way Bill Bramanti would use it?" said Bramanti's daughter, Cathy Bramanti, 42. Bramanti ordered the casket from Panozzo Bros. Funeral Home in Chicago Heights, and Scott Sign Co. of Chicago Heights designed the beer can. Gives you something to Think, Drink, and Be Merry about. Hmmm that would have been broadcast on the news over here, in the "Only in America" slot at the end of the program, reserved for those news items of folk who have small horizons and don't get out enough. That sounded like some Party! ( yeah right ) a casket full of beer and ice.., padded out with appointment cards for the Cirrhosis Clinc no doubt... talk about elephant in the room..
PBR should be paying for his funeral! Some would say that ANYONE who drinks PBR pays for it -- usually the next morning! But, I'm a glutton for punishment sometimes!